Twitter is an online news and social media platform where users can post and interact with messages that are called tweets. It has around 328 million active monthly users worldwide, with around 317 million active monthly users tweeting around 500 million tweets every day (Statista 2017). Twitter is used by businesses as a tool for brand engagement, product announcements, and customer service. This article is an excerpt from a book written by Srini Janarthanam titled Hands-On Chatbots and Conversational UI Development. In this article, we will explore the Twitter API and build core modules for tweeting, searching, and retweeting. We will further explore a data source for news around the globe and build a simple bot that tweets top news on its timeline. Log on to Twitter. If you don’t have an account on Twitter, create one. Go to Twitter Apps, which is Twitter’s application management dashboard. Copy consumer key and consumer secret and hang on to them. Copy the Access Token and Access Token Secret and hang on to them. Now, we have all the keys and tokens we need to create a Twitter app. Let’s build a simple Twitter bot. This bot will listen to tweets and pick out those that have a particular hashtag. All the tweets with a given hashtag will be printed on the console. This is a very simple bot to help us get started. In the following sections, we will explore more complex bots. To follow along you can download the code from the book’s GitHub repository. Run npm install request --save to install the Request library as well. We will use this in the future to make HTTP GET requests to a news data source. In the preceding code, put the keys and tokens you saved in their appropriate variables. We don’t need the request package just yet, but we will later. Replace #brexit with the hashtag you want to listen to. Use a popular one so that you can see the code in action. Run the index.js file with the node index.js command. Congratulations! You have built your first Twitter bot. In the previous section, we explored how to listen to tweets based on hashtags. 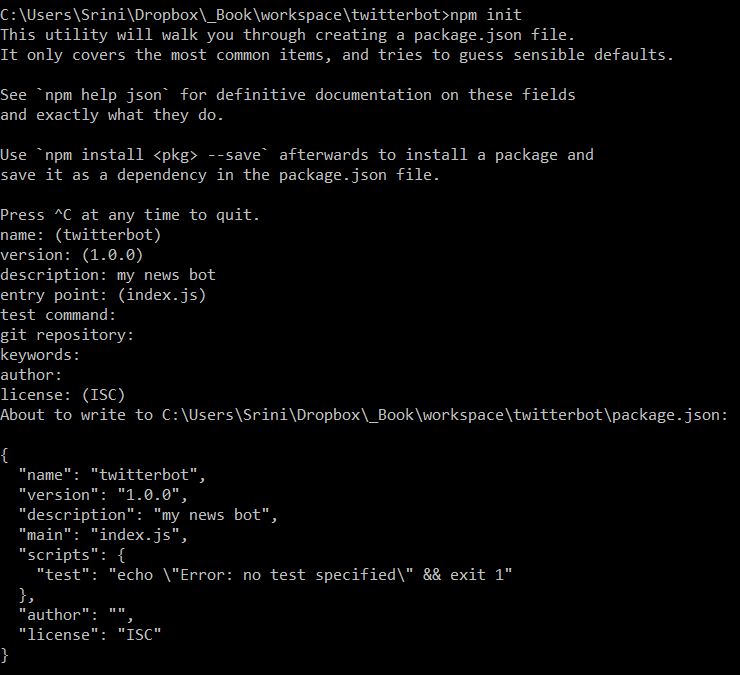 Let’s now explore the Twitter SDK to understand the capabilities that we can bestow upon our Twitter bot. In addition to tweeting on your timeline, you can also tweet in response to another tweet (or status update). The screen_name argument is used to create a response. tweet. screen_name is the name of the user who posted the tweet. We will explore this a bit later. Let’s now build a bot that will tweet news articles to its followers at regular intervals. We will then extend it to be personalized by users through a conversation that happens over direct messaging with the bot. In order to build a news bot, we need a source where we can get news articles. 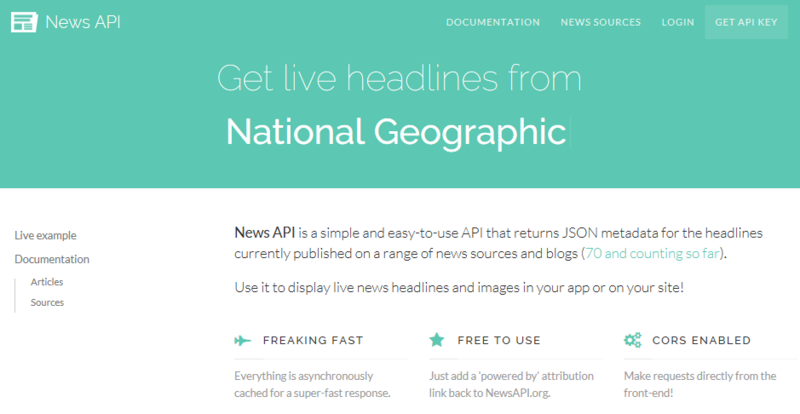 We are going to explore a news service called NewsAPI.org in this section. News API is a service that aggregates news articles from roughly 70 newspapers around the globe. breaking news, video, audio and feature stories. 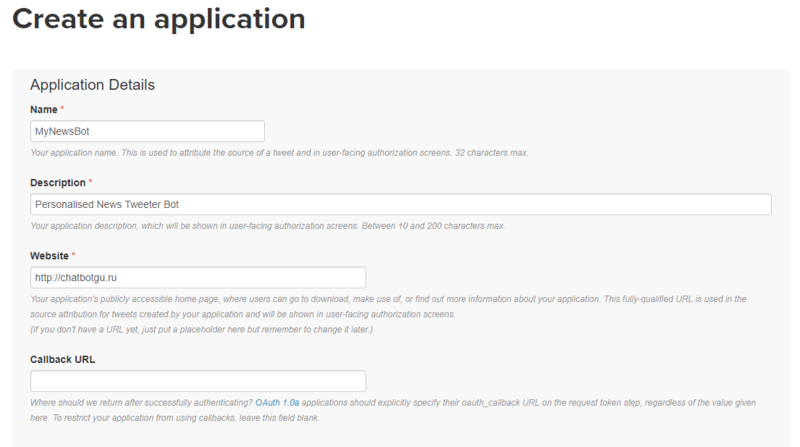 For each article, the author, title, description, url, urlToImage,, and publishedAt fields are provided. Now that we have explored a source of news data that provides up-to-date news stories under various categories, let us go on to build a news bot. Run the tweeter.js file on the console. 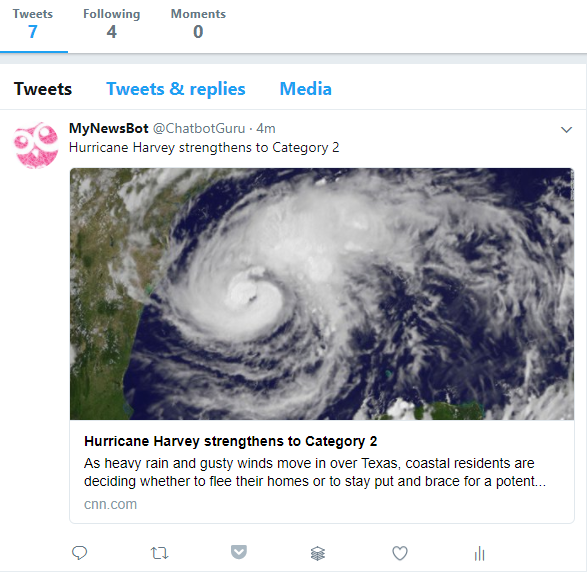 This bot will tweet a news story every time it is called. It will choose top news stories from around 70 news sources randomly. Hurray! 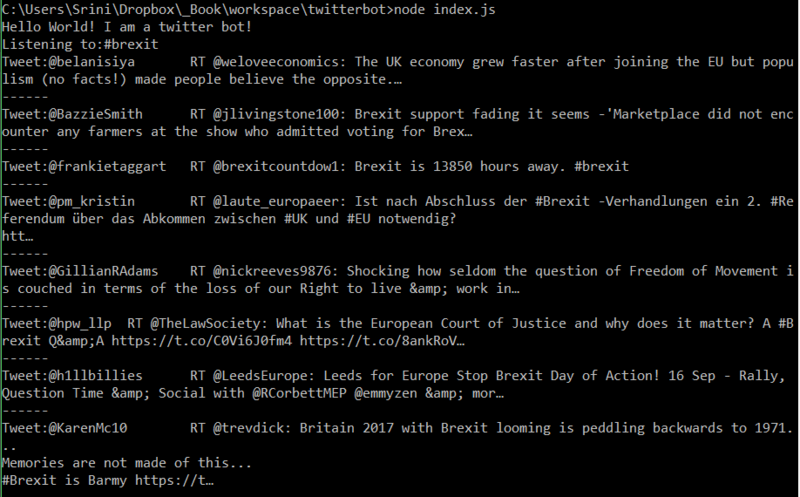 You have built your very own Twitter news bot. In this tutorial, we have covered a lot. We started off with the Twitter API and got a taste of how we can automatically tweet, retweet, and search for tweets using hashtags. We then explored a News source API that provides news articles from about 70 different newspapers. 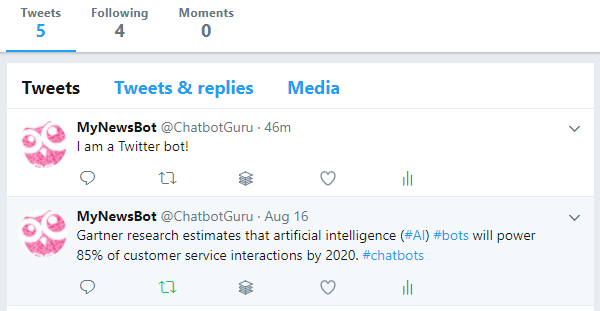 We integrated it with our Twitter bot to create a new tweeting bot. If you found this post useful, do check out the book, Hands-On Chatbots and Conversational UI Development, which will help you explore the world of conversational user interfaces. Instead of the hashtag argument is it possible to use a Twitter handle and return user tweets?